LEGO has always been a source of inspiration for artists and designers to create something extraordinary out of ordinary bricks. The Batcave by two LEGO artists Carlyle Livingston II and Wayne Hussey is a creative piece of art that simply takes you to the mysterious abode of the Batman. 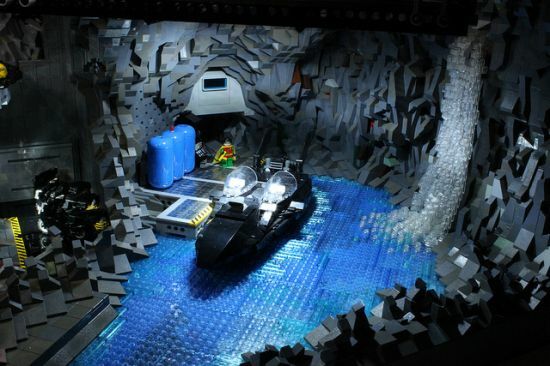 Displayed at the2012 Emerald City ComiCon, the LEGO Batcave was made using over 20,000 LEGO bricks. Weighing over 100 pounds, the artistic unit took more than 800 hours in over twelve weeks for completion. The Batcave makes use of a single battery to illuminate different LED Christmas and flash lights. Featuring different chambers to park Batmobile, Batcopter, Batplane and other vehicles, the Batcave also presents storage for equipment, surveillance and moving parts to give it a realistic look.